We created the drawings for the new bathroom and advised the suite the client should buy to ensure everything fitted in the space. 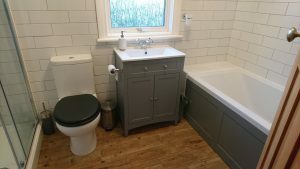 Because the existing bathroom was over 30 years old, there were a lot of challenges along the way, including false walls and an unstable floor hidden by the wall and floor finishes that both had to be rectified before we could start plumbing or tiling. We strengthened the wall and floor, then our plasterer skimmed the entire room. 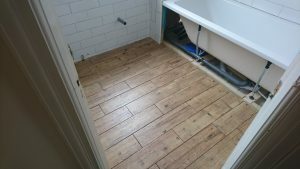 We laid wood-look tiles on the floor. Our plumber re-plumbed the entire room. 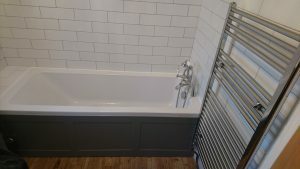 We installed a new bath, with a shelf for storage. We also plumbed in a heated towel rail, strengthening the wall behind. 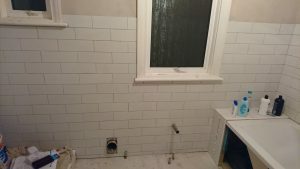 The client wanted a walk-in shower, where a corner bath once was. The result is a light and airy, timeless bathroom design. 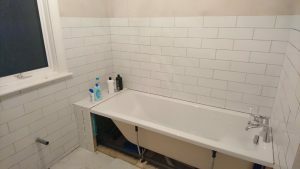 Our plumber moved all the pipes into their position, then we tiled the area and fitted the bathroom, installing a false wall to accommodate the pipes for the shower and a shelf for the bath. 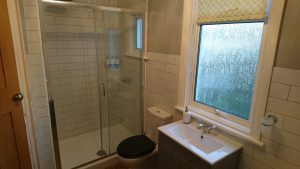 We also installed a new waste pipe to ensure it could hold the waste water from the enhancements and an ensuite bathroom. 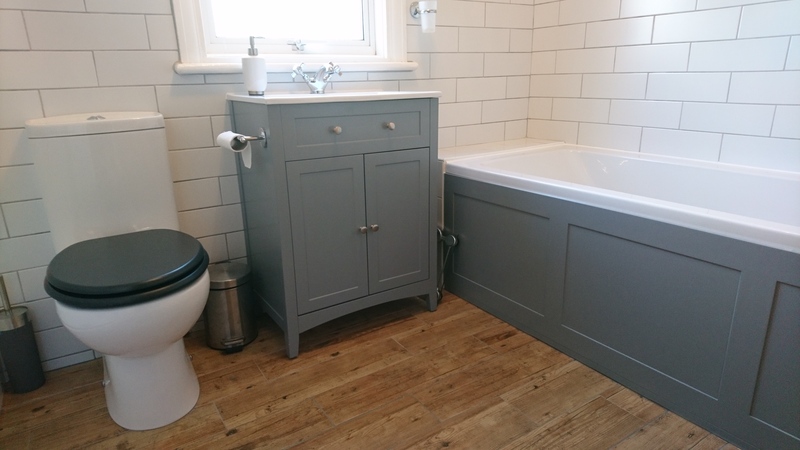 When the pipes were in place, we were able to install the new suite and finish the room with details including silicone and panels that ensured all elements could be easily accessed if needed.